The U.S. Army will have a tough choice to make about William Cocke when he graduates in May 2019. Cocke, a 4th year PhD student in UW–Madison’s Department of Mathematics and ROTC cadet, has cultivated several skills critical to national security and defense. Cocke joined the Army ROTC Badger Battalion during his second year at UW–Madison, after his interest was piqued in U.S. Army Cyber Command—a component of the Army dedicated exclusively to cyberspace operations security. Once connected with the ROTC program, he also decided to study Urdu through Project Global Officer (GO). Project GO, which is funded by the Department of Defense, is a collaborative initiative with the Defense Language and National Security Education Office. The program builds the language skills, regional expertise, and intercultural communication skills of ROTC future military officers. Students participate in domestic and overseas language study and cultural immersion for the study of critical languages, such as Hindi, Indonesian, Russian, and Urdu—all of which are offered at UW–Madison. 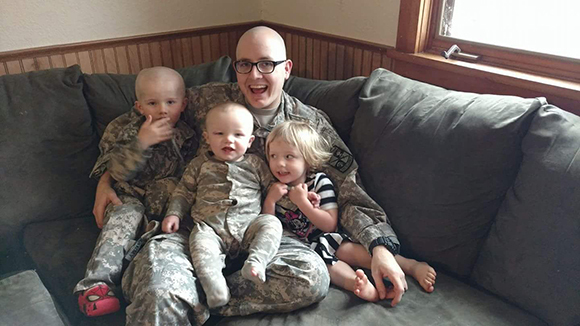 Wil Cocke (pictured with family) is pursuing critical languages and cybersecurity as a member of the Badger Battalion. Cybersecurity and Urdu have more in common than might first appear. Cocke explained that cybersecurity and linguistics often overlap, with language and cultural skills serving to help identify key information. He also noted that Urdu is a critical language as the U.S. continues involvement in countries in South Asia and the Middle East where Urdu is spoken prominently. Cocke is finishing his second year studying Urdu at UW–Madison, including two summers through Project GO, and has already seen considerable gains from the program. Before joining Project GO, Cocke said he knew only a few words of Urdu. Today, Cocke is approaching working professional fluency, a level that would let him interact with others in a professional environment and have conversations about work, aspects of life, and organization needs. In the meantime, he plans to continue studying Urdu, and also begin learning Pashto, a critical language native to Afghanistan and Pakistan. Pashto will be a fourth language for Cocke, who learned Mandarin in Taiwan during a two-year mission trip. Cocke, who studies finite group theory—systems that behave like we expect numbers to behave but have different attributes—will graduate and commission in May 2019. Although his specific branch has yet to be decided, he hopes to serve on Active Duty as a Cyber Officer. Since Project GO began at UW–Madison, more than 100 ROTC students from 47 schools have been awarded Project GO scholarships for language studies. Forty awardees have been from UW–Madison or other Wisconsin higher education institutions. Through programs such as Project GO, UW–Madison is helping to prepare the next generation of military officers, foreign area officers, federal service agents, and other leaders for an increasingly interconnected and global world. Laura Hammond, executive director, Project GO, said that the program is able to act as a talent pipeline for developing professionals skilled in critical languages such as Urdu. In addition to Project GO, UW–Madison is also home to the Russian Flagship Program, a federally funded program that gives undergraduates of all majors the opportunity to reach a professional level of fluency by graduation. Students enroll in courses on Russian language and culture on campus and study abroad in Russian speaking countries at least twice–the second time on an academic-year overseas capstone program, during which students complete a professional internship. The UW–Madison Russian Flagship Program is funded by The Language Flagship, a major component of the National Security Education Program in the U.S. Department of Defense. “The University of Wisconsin–Madison Russian Language Flagship and Project GO programs are critical to building the high-level language skills that are vital to national and economic security,” said Michael Nugent, director of the Defense Language and National Security Education Office and National Security Education Program. Since the Russian Flagship was established at UW–Madison in 2010, 32 students have completed the program with superior-level proficiency and have been certified as Flagship Global Professionals. Currently 48 students are participating in the program. While Project GO and the Russian Flagship Program are molding the next generation of international leaders for the nation, one of the university’s newest projects, the Wisconsin Language Roadmap, is aimed at transforming the state. The goal of the Wisconsin Language Roadmap, which is funded through a two-year federal grant from the National Security Education Program of the U.S. Department of Defense, with substantial support from the University of Wisconsin–Madison College of Letters & Science and the International Division, is to enhance the economic competitiveness of Wisconsin by strengthening language education for students across the state. 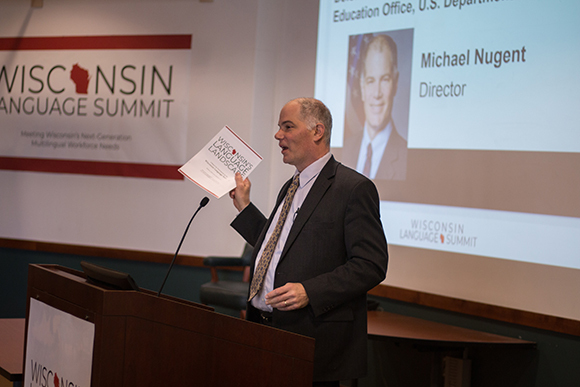 Michael Nugent, director of the Defense Language and National Security Education Office and National Security Education Program, addresses attendees from multiple sectors across the state during the Wisconsin Language Summit on January 26, 2018. “The Wisconsin State Language Roadmap is an excellent example of efforts to promote effective partnerships between the states and the federal government in addressing the language needs for the entire country,” Nugent said. Ensuring students develop strong language and cultural fluency skills is crucial for Wisconsin to attract and interact with international companies, meaning new economic growth and more opportunities for Wisconsinites. Wisconsin’s economy is already significantly impacted through foreign-owned companies and international trade. According to the International Trade Administration, Wisconsin exported $21 billion in goods and services to foreign nations, with top export markets including Canada, China, Japan, Mexico, and the United Kingdom. Foreign-owned companies employed 90,000 Wisconsin workers in 2014.